White House Utility District (WHUD) is one of the largest water and sewer utilities in the state of Tennessee, serving approximately 90,000 customers with 30,000 connections, across a 600-square-mile area. This incorporates portions of Tennessee counties: Sumner, Davidson and Robertson. As the largest water district in the state geographically, they serve areas extending from White House north toward Portland, south, toward the cities of Gallatin and Hendersonville, and west to the eastern portions of Robertson County. Headquartered in White House, the District serves the cities of Portland, Cross Plains, Orlinda, Springfield, Millersville, Greenbrier, Ridgetop, Goodlettsville, Hendersonville and Gallatin. They also provide wholesale service to Simpson County, Kentucky. While developing a network of pipelines, pumping stations and storage units was challenging, the greater test came in finding access to a plentiful water supply. Original plans called for water service using a spring located in White House. It was later determined that this option would not provide the long-term reliability and quantity needed to meet demand, so planners turned their attention to constructing a treatment plant on Old Hickory Lake, some 14 miles away in Hendersonville. White House has approximately 1,000 miles of distribution mains and twenty-one storage facilities. They produce on average fourteen million gallons per day and had a reported 30% Non-Revenue Water (NRW) in the beginning of 2014. Water loss recovery and control is very important to White House, and in late 2013 they evaluated options for reducing their water loss. 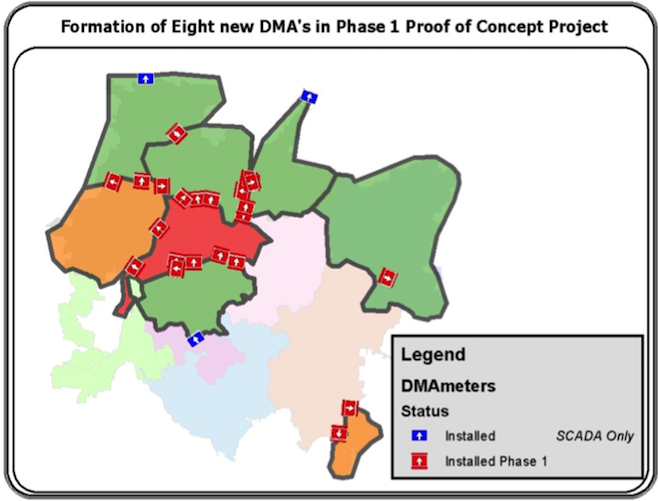 Due to their large geographical size and mix of pipework material, they decided that planning and implementing District Metered Areas (DMA’s) would be the most efficient way to reduce NRW to a targeted 15%. The most effective way to manage water within a distribution system is to divide the network into DMAs. The key principle behind DMA management is the use of flow data to determine the level of leakage within a defined area of the water distribution network. The establishment of DMA’s, which has been used in Europe for decades, enables current levels of leakage to be determined in any one part of a system, and consequently, leak location activities can be prioritized accordingly. Water entering each DMA is monitored and logged; this data is used to calculate usage within each DMA. 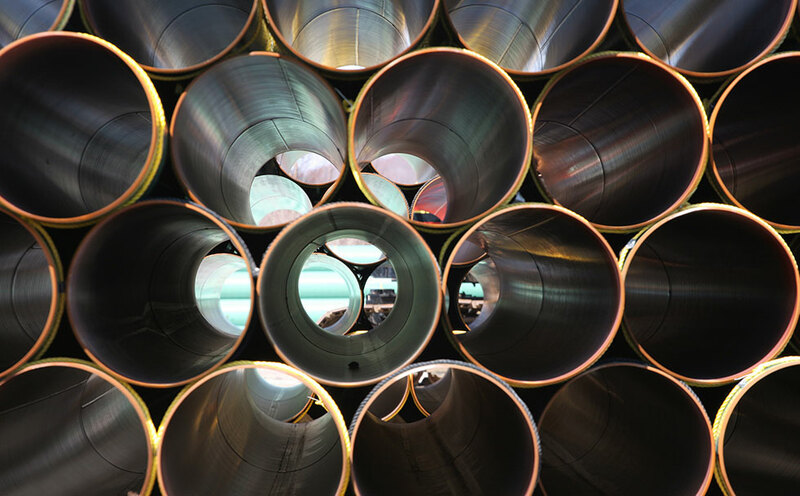 Key Performance Indicators (KPIs) measuring the acceptable flow rate are set for each DMA, and are calculated by several variables, such as customer connections and miles of water main. The data received from each DMA is used to compare one part of any system against another, while the historic data of any given DMA is used to compare the flow today versus previous day(s). Repeatability of flow and pressure data in conjunction with historical data is crucial to differentiating between problematic and healthy DMAs. By monitoring flows in DMA’s, it is possible to identify the presence of existing and new bursts, so that leakage can be maintained at the optimum level for that area. This data allows the utility to react quickly to areas with high leakage, and confirm and repair leaks instantaneously. Unexpected and noticeable increases in water can indicate potential leakage. Leakage is energetic and while initially significant, reductions can be made. Levels of leakage will continue to rise as time elapses, unless an on-going leakage control program is implemented. Fundamental to DMA management is the correct analysis of flow data in order to determine whether or not excess leakage exists, and to identify the presence of new leaks. The extent of leakage can be gauged by assessing the 24-hour flow pattern of a network. A limited variation between the minimum and peak flow, particularly in a network with little industrial night use, is indicative of a leaky network. However, this approach does not allow the leakage level to be directly quantified. Leakage is most accurately determined when customer consumption is at a minimum during the night, and is referred to as the Minimum Night Flow (MNF). In addition to the daily data/trends, a water balance check can also be executed each month to gauge the actual NRW in any given DMA. Step testing can be executed in reasonable sized DMA’s or larger DMA’s can be split, usually by temporarily closing some valves within the system, yielding smaller sections called Sub DMA’s. Step testing narrows the search for active leaks even further. This process requires great planning and system knowledge. The DMA or Sub DMA is divided into small, more manageable sections by closing valve(s), therefore, at night each small section is shut off. Before any valves are closed, the MNF is recorded and this is known and the “START” MNF value. Then, as each valve is closed systematically this is called a “STEP” and the new MNF is recorded. The difference between the start and the new flow is your “STEP” value. DMA’s are not an alternative but rather a preceding and enhancing tool to standard leak detection practices. DMA’s allow leak detection efforts to be targeted as DMA’s indicate the problem areas where a leak is known to exist, eliminating the need to sound every inch of the distribution system in search of leakage. Also, DMA’s are a more permanent solution for reducing and maintaining targeted levels of NRW, as data is received continuously and leakage can be monitored after leak detection efforts are deployed and have been completed. White House considered various DMA flow meter options, and decided that the Hydreka HydrINS2 single point electrometric insertion meters offered them the most flexibility and the right data they needed to focus on their NRW reduction and control program. In early 2014, WHUD tested the HydrINS2 technology to ensure it met their requirements, and in spring 2014, they invested in a further twenty-five insertion flow meters to create eight DMA’s. Prior to the introduction of the HydrINS2s, WHUD already had four existing meters set up which were connected to SCADA. Therefore, WHUD established a total of twelve DMA’s, which would remotely send daily flow and pressure data to their headquarters. The data generated from each DMA is analyzed on a daily basis and entered into their current GIS system. In conjunction with the meter(s) purchase and installations, they also invested in leak detection equipment, acoustic noise loggers, and a ground microphone, for in-house use. This enables WHUD to be pro-active and focus leak detection efforts on DMA’s with high usage and flow. This practice ensures they are as efficient as possible in targeting leakage; they are now able to concentrate on high priority areas first. In addition, this practice allows them to calculate the volume of NRW (including leakage) they have in any one DMA. All data is imported into GIS (ESRI) including the acoustic noise logging data for increased awareness, tracking, and acoustic foot printing. GIS integration is a key to the overall success and efficiency of DMA management, and also allowed WHUD to determine the KPI values. 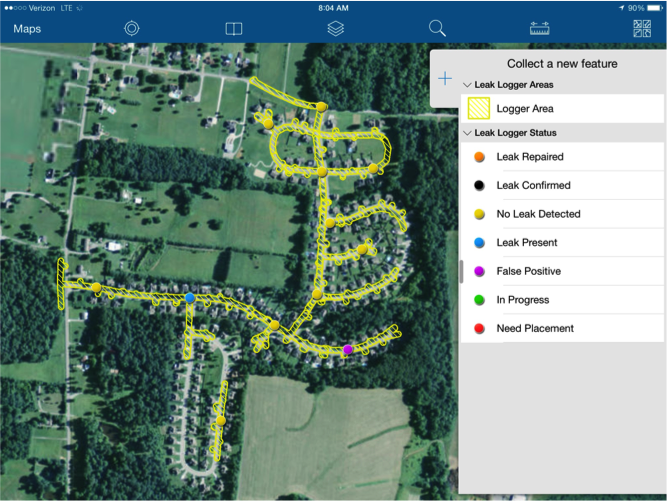 The GIS tool knows how many customer meters appear in any given DMA/SubDMA polygons and it divides the Minimum Nighttime Flow value entered from Winfluid, the HydrINS software, by the number of connections. That gives the actual, or observed KPI value. The target MNF is a value they enter as a goal for the area. WHUD selected 0.05 gpm/connection as a target to get the program off the ground after seeing where they were in the beginning of the program. 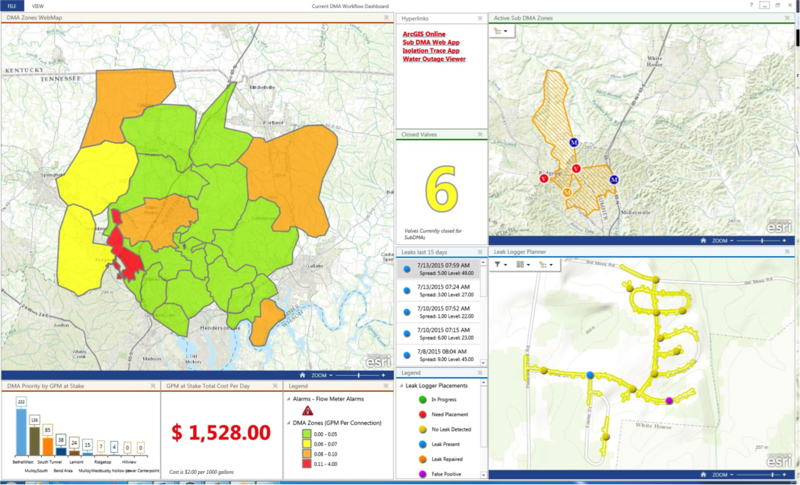 The GIS tool does a calculation to compare “Actual” to “Target” on the KPI’s and then returns the “Gallons at Stake” value in gallons per minute so they know approximately how much leakage, and how many dollars in savings, they are looking for in that area. As of June 2015, seventy-three leaks have been confirmed in the twelve DMA’s. The leaks were identified and confirmed through a mix of DMA analysis, step-testing, acoustic logging, and standard leak detection practices. The leaks varied from 1 GPM to over 100 GPM with an average of 15 GPM. The leaks combined contribute to water loss of 1000 GPM. Once the seventy-three leaks are repaired, WHUD will save $2,520 per day, $75,600 per month, or $919,800 per year, all contributable to their water monitoring and leak detection efforts. WHUD continues to monitor from their Zone and DMA’s meters daily, in order to prioritize their pro-active leak detection efforts. In spring of 2015, they purchased an additional forty-one HydrINS insertion meters in order to create a total of thirty DMA’s to cover their entire system by September 2015. Currently, DMA’s cover only a third of the District. WHUD also plans to have full GIS integration around the same time. In addition, they plan to expand on their pro-active leak detection surveys and evaluate solutions to ensure the analytical process for the DMA data is as automatic and as timeless as possible. This will enable them to reach their target of less than 15% NRW and their return on their investment within the next three to seven years. WHUD also continues to work in partnership with ESRI and between them they lead the US market in development of effective and efficient NRW GIS tools. WHUD plans to have fully DMA/GIS integrated systems by the end of 2015.